Note my type-o. Human frailty alive and well on social media. Thank goodness for grace. 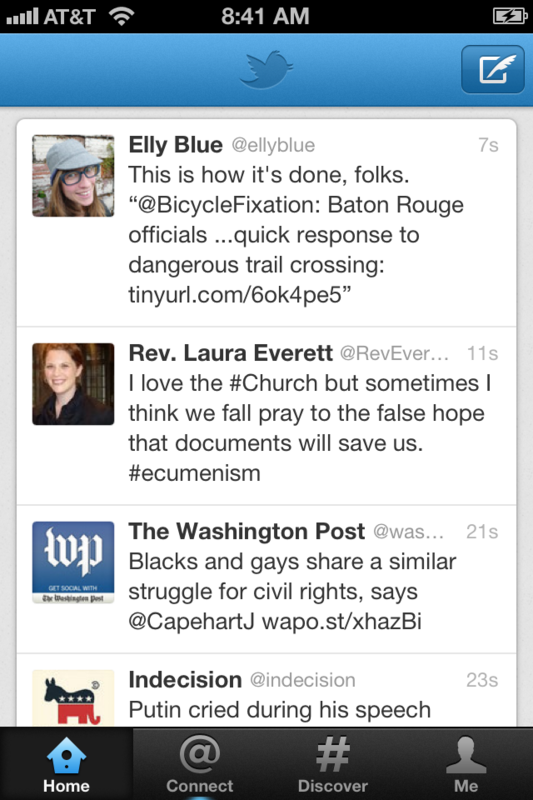 At a wonderful meeting with the other Executive Directors of state council of churches, in a conversation about messaging and advocacy, I testified that tweeting (http://twitter.com/reveverett) is a discipline where I practice being concise. I didn’t notice much response. I asked how many were on Twitter. Of the 17 in the room, 3 tweet: the three youngest executive directors. As Christians, we are called to testify to the unity of the body of Christ and heal the divisions. What happens when our divisions are digital and generational? I hear a lot of guilt from generations being asked to learn something strange. Guilt is theologically poor motivation for someone to join social media to communicate what they love. I think the obligation is on the practitioners to make the case across generations that social media is a powerful tool for evangelization and reconciliation. I’ll enjoy exploring this with you at the April 28th MA Council of Churches Annual Meeting! I’ve also found powerful emotions around this issue, including shame and self-judgment people carry because they don’t understanding the technology. A big part of encouraging people to use these tools for ministry is to set them at ease, remind them we are all learning, and to respond thoughtfully to every question people have, both great and small. I, too, am looking forward to the MCC annual meeting. In my experience, fear seems to be the ruling emotion, one that’s easily exacerbated. Alas.